Step 4 START REPLACING THE DONUTS WITH MORE HEALTHY ALTERNATIVES. ie: carrots, apples,bananas, grapes etc BAHAHAHAHAHAHA As IF! Just keep them away from the front desk cause whaleshape does NOT look good on me! I’m going with Step 5!! COLLEGE STATION, Tex. (Real Estate Center) The Texas housing market has been going strong the last few years. While it’s likely to cool off some this year, the chief economist for the Real Estate Center at Texas A&M University said now is still a good time to buy or sell a home. Low interest rates make it an especially appealing time to be a buyer, said Dr. Jim Gaines. The biggest challenge is the lack of selection. “The only reason that it might not be a good year is some buyers may have a hard time finding what they want,” Gaines said. “We still have a shortage of existing inventory being listed for sale.” Last month, Texas had a 3.1-month housing inventory. The Center considers 6.5 months a balanced market. “You’ll have to work very closely with an agent or someone who is close to the market on a day-to-day basis, because in many of our markets properties are being grabbed up almost as soon as they come up for sale,” Gaines said, “often on the same day and with multiple offers.” In other words, once you find a home you like, be prepared to act quickly. This is good news for sellers, who will probably have no trouble getting the price they want — at least for the first half of the year. “I think we’re going to see a slowdown in the housing market this year, but the market’s not going to stall,” Gaines said. Harvard Law Professor Alan Dershowitz has been on talk shows expressing his concerns about the censorship that is taking place on college campuses. As I have mentioned in previous commentaries, it is helpful when someone who would disagree with you on everything from politics to theology at least agrees with your concerns about what is happening in the universities these days. Alan Dershowitz is right. I applaud him for speaking out about censorship and intolerance on campus. We need others to join him and speak out. Hosea 6:3 Let us know, Let us pursue the knowledge of the Lord (with Philippians 3:10). His going forth is established as the morning; He will come to us like the rain, Like the latter and former rain to the earth. Lamentations 3:21-23 This I recall to my mind, Therefore I have hope. Through the Lord’s mercies we are not consumed (see Malachi 3:6), Because His compassions fail not. They are new every morning; Great is Your faithfulness. Notice a theme running through these Scriptures and Spurgeon’s comment? National Disc Jockey Day is observed annually on January 20th. A disc jockey, or DJ for short, is a person who plays recorded music either on the radio or at a club or event. The first disc jockey was an experiment on the airwaves. In 1909, sixteen-year-old Ray Newby was a student under the supervision of Charles “Doc” Herrold at Herrold College of Engineering and Wireless. He played the first records over the airwaves before the word disc jockey even existed. I got to do some Disc Jockey work years ago, I guess around 1974 at KBUY Country Music studio which was located in the old Seminary South Shopping Center. Started learning how from the main afternoon drive Dude and station manager then progressed to doing a Sunday morning show introducing Church’s, etc. from 7-11 AM then from 11- Noon got to play music. After that did the Midnight to 6 am program for several months, lotta fun. The Texas economy continued to grow in November but at a more modest pace in the face of a weakening global economy, lower energy prices, and a strong dollar. Total employment expanded but was weighed down by the manufacturing and oil and gas extraction sectors, especially in Houston. Housing demand has started to show signs of slowing down in Texas while new construction was constrained by a shortage of skilled labor and developable lots. 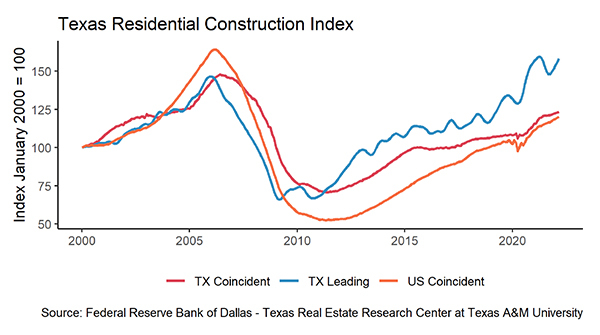 The Texas Residential Construction Leading Index (RCLI), which signals future directional changes in the residential construction business cycle of single- and multifamily housing, continued to increase in November. The RCLI was positively affected by increases in weighted building permits and especially by housing starts that registered a strong increase in the second half of 2015. Multifamily construction remained robust. The Texas Residential Business Cycle (Coincident) Index measures current construction activity; it turned down in November after a slowdown in activity during prior months. Single-family housing construction permits statewide increased moderately in November with declines in the year-over-year growth in Austin and Houston. Dallas continued with sustained growth though slowing down. No major MSA has reached its prior peak permitting levels. Housing starts in Texas continued to climb in November, helping alleviate the restricted supply somewhat. 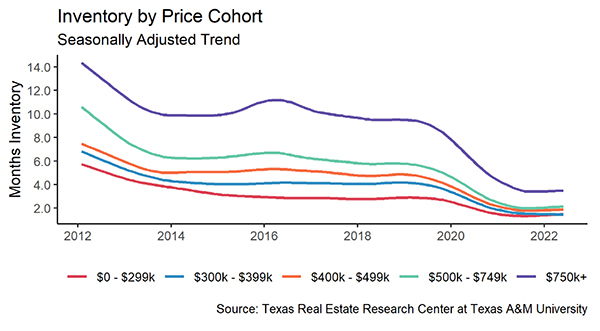 Months of inventory for existing homes across Texas remained low but registered modest upticks the past couple of months to nearly 3.5 months of inventory (around 6.5 months of inventory is considered balanced). It is still too soon to tell if a trough has been reached, and an upward trend will continue going forward. 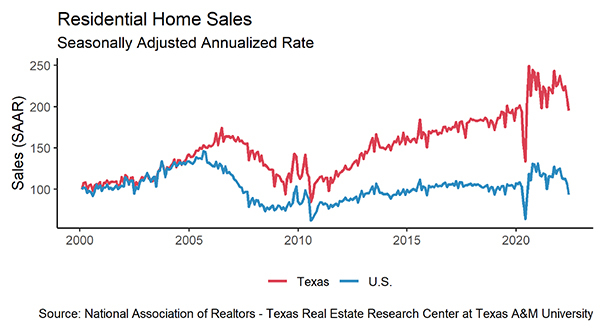 In November, total Texas housing sales decreased 0.5 percent year-over-year seasonally adjusted and decreased 1.8 percent on a not seasonally adjusted basis. Three of the five major metros — Austin, Dallas and Fort Worth — posted solid home sales increases. Houston had a negative 5.6 percent year-over-year seasonally adjusted change (negative 10.7 percent not seasonally adjusted). Year-to-date, 2015 Texas home sales registered positive growth, but the rate of change lagged behind the nation. Mortgage interest rates have remained slightly below 4 percent. In November, the Federal Home Loan Mortgage Corporation reported a 3.94 percent average rate on a 30-year, fixed-rate mortgage, while the 30-year U.S. Treasury bond yield equaled 3.03 percent. The number of days an existing home was on the market remained low relative to prior periods reflecting the tight supply. New homes had somewhat longer November sales periods in Austin and Houston compared to Dallas and San Antonio. The average statewide difference to sell a new home versus an existing home was 39 days in November. Average and median sales prices have risen dramatically in Texas since 2011 and continued to climb in November. The constrained supply, in conjunction with strong demand, accelerated price gains. Austin has been the house-price-appreciation leader through November 2015. Nonenergy employment growth and a strong services sector caused Dallas to register even stronger price appreciation, followed by Fort Worth and San Antonio. Due to recent declines in the energy sector and the resulting economic slowdown, Houston has begun to exhibit a softening in price growth. Texas’ existing and new home sales prices have steadily climbed in the major metros. Since 2011, new median home prices exceed existing home prices by 48 percent and by 37 percent based on average sales prices. This price differential results primarily because of increases in home size for newer homes and the significant increases in construction and land costs for new homes. The price per square foot for a new home in Texas was almost 20 percent more than for an existing home. 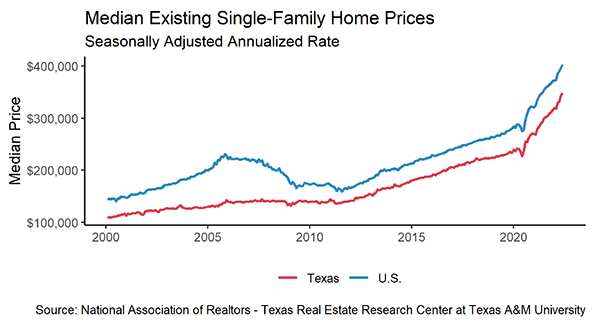 Even with rapid price appreciation, purchasing a home in Texas continued to be relatively affordable compared to the rest of the United States, but the gap appears to be closing. The rate of increase in personal and household income greatly lags the increase in home prices. …And I still am today! I’ve attended this class several times and always come away with some very good ideas and a plan to implement them!